It was one of the most successful thriller series ever, starting with The Girl with the Dragon Tattoo. Author Stieg Larsson had intended many instalments but completed only three before his untimely death. Now his publishers’ appointed successor David Lagercrantz does not disappoint Millennium trilogy fans with this slow-burning follow-up, The Girl in the Spider’s Web. Lisbeth Salander is back with a vengeance, and Lagercrantz’s depiction matches perfectly with her creator’s. With its brooding characters, darker tone and updated technology, his novel is enjoyable as both a continuation of the series and as the stand-alone sequel that Lagercrantz intended. Mikael Blomkvist is once again making headlines, but this time the media is claiming that his reign as a superstar journalist is over. Millennium is struggling and his lover Erika Berger has convinced him to sell 30 per cent of the business to a major news syndication called Serner, headed by an old rival from his temp days. But when he walks out of an important meeting, he is faced with the prospect of unemployment under the guise of being transferred to London. While contemplating his fate he is contacted by a former assistant to artificial intelligence genius Professor Frans Balder and it seems this could be the big scoop to attract some much-needed funding to Millennium. But the real draw is that a mysterious superhacker has been working with the professor, and the description of her is all too familiar. Professor Balder has returned to Sweden with his research, intending to take charge of his autistic son August much to the anger of his ex-wife’s new partner, who has come to rely on child support payments to support his drinking habits. But Balder refuses to take no for an answer, despite not having legal custody of the boy, and takes August home. Uncommunicative up to this point, the child shows savant abilities after returning from a visit to his father’s friend and recreating a snapshot of a mysterious man they passed on their way home. Meanwhile, Lisbeth Salander has taken on the National Security Agency, crossing oceans in order to uncover some dirty laundry. The head of security, Ed Needham, is furious and vows revenge on the hacker who has disrupted his carefully planned systems. But, like her, he finds himself dragged into the world of a cyber criminal group, headed by the mysterious Thanos, who will stop at nothing to get their hands on Professor Balder’s research. From a slow-burning start to a thrilling conclusion, the understandable differences in style between Lagercrantz and Larsson make this an interesting addition to the series. The inclusion of key elements that Larsson himself introduced in The Girl Who Kicked the Hornet’s Nest provides familiarity for readers, and a list of main characters makes it unnecessary to revisit the trilogy before reading the new instalment. 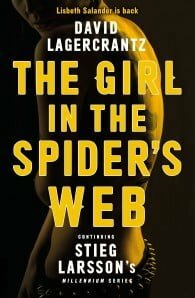 With The Girl in the Spider’s Web, Lagercrantz brings Salander and Blomkvist to the present day, touching on technology not available during Larsson’s own lifetime. A journalist and writer, David Lagercrantz was a criminal reporter at the Swedish newspaper Expressen and is the author of four novels and the bestselling sports biography, I Am Zlatan Ibrahimovic. Better Reading’s Book of the Week, 20 of the Best Books for Father’s Day, 24 Books to Get Excited About in September, Is It a Story? Is It a Book? No, It’s a Film!